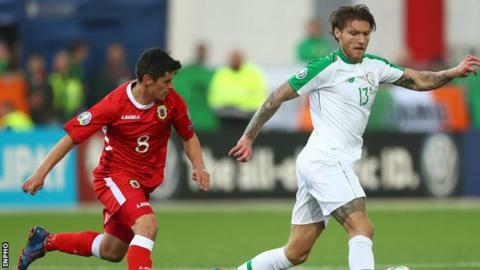 Republic of Ireland midfielder Jeff Hendrick says his side have a chance to "put pressure" on their Group D rivals with a win over Georgia on Tuesday. Mick McCarthy's side laboured to a 1-0 victory over Gibraltar in their opening Euro 2020 qualifier on Saturday with Hendrick scoring the winning goal. "Six points would be good for our morale and momentum," he said. "We want to be putting points on the board and putting pressure on other teams in the group." Burnley's Hendrick brought his two-and-a-half year international goal drought to an end with a 49th minute strike that spared the Republic's blushes against a side ranked 194th in the world. What is going on with Irish football? The former Derby County player was restored to his favoured position of central midfield having predominantly played on the right for his club this season. "(centre midfield) is where I have played for most of my career," he said. "When I have been playing in other positions I have just been filling in or doing a job for the team but I am definitely more comfortable in the middle." Under Martin O'Neill the Republic managed just four goals in their nine matches during 2018. Stoke City's James McClean is the only player in the current squad to have reached double figures in his international career and manager McCarthy, in his second spell at the helm, has urged his midfielders to push forward and contribute more in front of goal. "I am aiming to get more goals and that is what I have been trying to do. I have to get in the box more," admitted Hendrick, who was partnered in midfield by Conor Hourihane against Gibraltar. "Both of us like to get forward so it was between the two of us for one to get forward and the other one sitting back and mopping up." Georgia last travelled to Dublin in 2016 during the World Cup 2018 qualifying campaign, when a Seamus Coleman goal gave the hosts a 1-0 victory. A repeat of that result would leave the Republic well placed going into their next pair of fixtures in June which will see them travelling to Denmark before a home tie against Gibraltar. Paul McGinley says the Irish Open cannot expect to attract all the star names, after Rory McIlroy decides not to compete in this year's tournament.